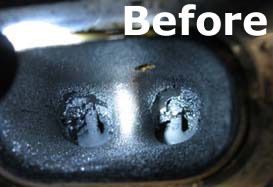 About BPG’s Carbon Cleaning Service: We use the factory BMW tools to perform this job. Using the factory tool ensures the job is done right the first time and that there is no mess. After the intake manifold is removed and all ports are cleaned with BMW factory tools and BMW approved walnut shell media. The manifold goes back on and everything is tested and checked. 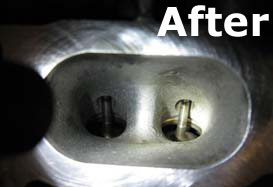 What causes carbon build up on the intake valves? These modern BMW engines are direct injection; this means in particular that the fuel is injected directly into the combustion chamber of each cylinder and not in the intake tract. As a consequence thereof, the fuel injectors are no more placed before the intake valve, but directly in the cylinder itself. The disadvantage of this is that the regular bathing and therefor cleaning of the intake valves by way of the fuel that they are exposed to no longer happens. The intake valves are only in contact with air and blowby gases from the crankcase breathing circuit, in which substantial quantities of fuel and oil can be found. Over time, these lead to deposits of carbonized fuel and oil in the intake tract as well as on the intake valves themselves. This is not immediately bad for the engine, but over time can have a detrimental effect on its efficiency. If the valves are heavily carbonized, they will not close properly anymore, and symptoms such as a bumpy idle, vibrations and diminished throttle response can be observed; it may also contribute to increased oil consumption. As unfortunately this carbonizing effect is an inevitable byproduct of direct injection, it cannot be prevented. The use of additives in the fuel itself is useless, as (see above) the fuel does not come into contact with the intake tract or the valves at all.